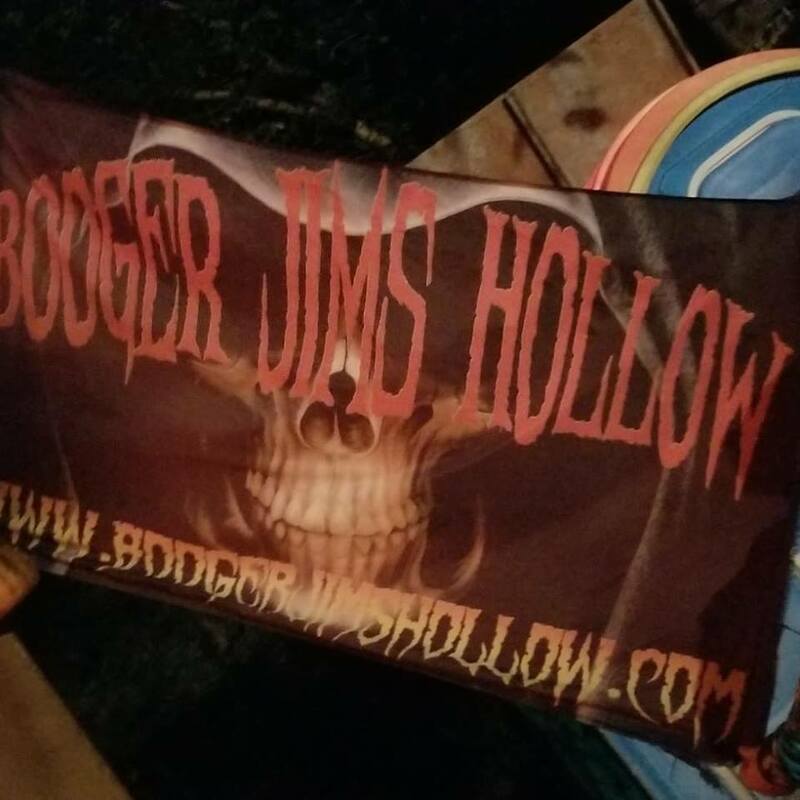 Booger Jims Hollow is a Haunted Attraction located in Blacksburg, SC. Team Jefferson Starship reviewed this Haunted Attraction on October 27, 2018. 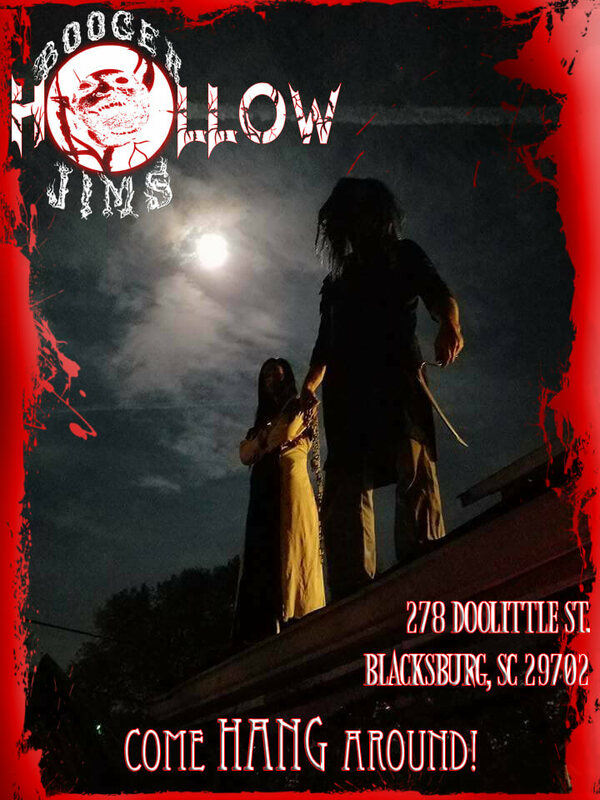 Nestled in the old mill town of Cherokee Falls right outside of the old Iron Town of Blacksburg, South Carolina rests the haunted attraction known as Booger Jims Hollow. A hollow, in this case, being a small v-shaped valley, or even a low, wooded area. A “booger” in this case is a ghost… a spirit. 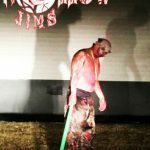 Booger Jim, so the legend goes, is the ghost of an angry man who once lived in the area that killed his own family in a fit of rage, only to commit suicide when he’d discovered what he’d done. 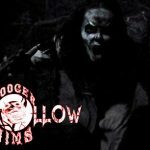 Such a tale might be enough to inspire all manner of local legends, and the cast and crew of Booger Jim’s Hollow (BJH) work to bring out the scares for you. Now, if you’re traveling along I-85 and its ever-expanded retinue of haunted attractions, the idea of a steep-sided valley may not immediately jump to mind. However, in the short jaunt from the bustle of the interstate, you’ll be transported along some very twisty, winding mountain roads until you find yourself at the base of a small rise, dotted with the old homes of the old mill community. 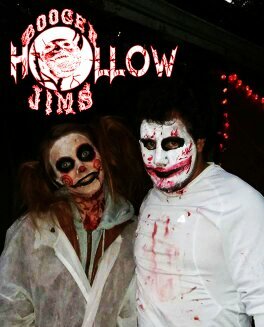 Back up this hill, you’ll find Booger Jims Hollow. 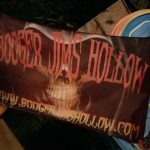 Bring your hiking boots and wear some clothes you don’t mind getting dirty because, down in Booger Jims, you’re likely to encounter all manner of things that go bump in the night. BJH consists of two main attractions – a walking trail and a haunted house. There is also a small hayride (for a very small additional charge) that will take you through the old mill town to see all the old houses that once made up this community. 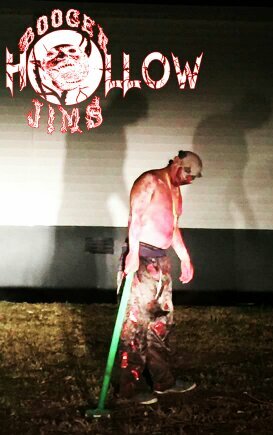 There are about a little less than two dozen actors spread across the hills and house of Booger Jims Hollow braving the cold temperatures, the dark nights, and the cold ghost of Booger Jim himself. The trail actors were very interactive, constantly warning us to, “Look out for Booger Jim,” warning us of his coming, or that he was going to, “get [us].” The crew here are more than willing to add touching to your experience, but it’s never offensive or threatening. The clown, the doctor, and the contortionist on the trail make great use of their surroundings and the disorienting nature of the trail itself to constantly vanish and reappear when you least expect it. Beware of the Box! You’ll find it along your path and cannot escape it’s pull – until you’re released by the creatures that have trapped you. Everyone does a good job of staying in character – whether its an in-your-face clown, a leg-chopping chainsaw-wielder, or a spooky, looming figure. Some of the masked figures at Booger Jims Hollow could have used better-fitting masks, but overall, masks, costumes, and makeup were done well. In particular, a seemingly-glow-in-the-dark mask by one creature, the doctor on the trail, a clown on the trail and some other clowns in the house were all on point. There’s a fair mix of both makeup and masks. One would perhaps expect more makeup on the outdoor crew given the variable nature of their environment and the sometimes sight-destroying properties of some masks. However, the trail crew do a good job of working in and around and even through their sets, masks or no. The house certainly has a few more masks, but also at least a couple of individuals in heavy makeup. With their slightly more-controlled environment, we’d like to see more makeup and effects skills come into play. However, while you’re navigating the twists and turns (and maybe even a barrel-roll), you probably won’t have time to stand around analyzing such minor details. Chances are, you’ll be moving rapidly from one room to the next ahead of silently-approaching monsters and darting away from dark corners. The parking lot of Booger Jims Hollow is easy to find. Plug the address into the GPS, brave the winding, twisting roads, and find yourself at the bottom of the rising hill. Finding your way up to the ticket booth might be a bit of a head-scratcher (head up the street towards the lights of the Hollow), but there’s usually a parking attendant waiting near the truck that pulls the hayride available to point you in the right direction. 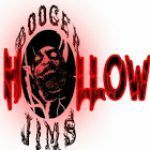 The hollow inhabited by Booger Jim’s spirit (and the cast of the haunt) is literally on the side of a mountain. There are slippery steps and steep climbs in the hollow itself. There are, however, lights, railings, and even the monstrous crew themselves who are there to help if you run into any trouble. The cast and crew are friendly and approachable. 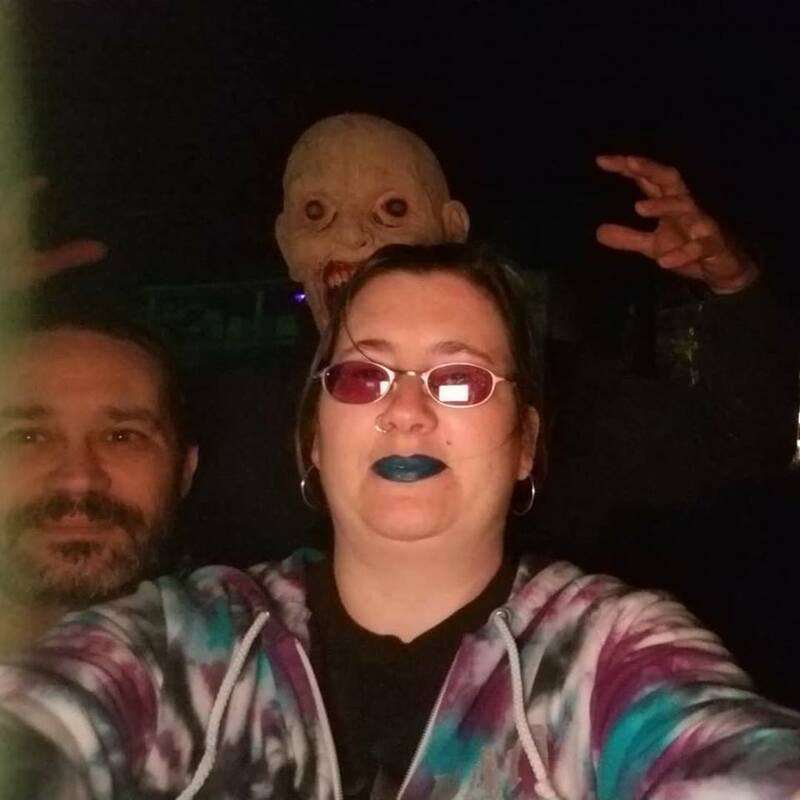 Though the haunt puts on a full-touch show (alleviated with a no-touch pass for a small up-charge), they still all seem enthusiastic about the customer having a good time and providing a lot of fun and entertainment if they can’t immediately produce a startle or scare. Did we mention that you’re walking and climbing into, up out of, and down from a ravine on the side of a mountain that’s surrounded by what seems to be an abandoned mill town? What more could you ask for as a setting for a haunt? Take the time to soak in the view. Take the brief and inexpensive ($1 a head) hayride through the neighborhood. Immerse yourself in the setting and then let the creatures hidden behind the walls and the woods work their magic on you. The house itself looks like a house decorated for Halloween; but, occasionally, monstrous figures slink out from any of its many entrances and exits to thrill the waiting crowds. The trail is topped with a large arch, lit and inviting – if you can get past the sounds of screams and chainsaws that echo from within. 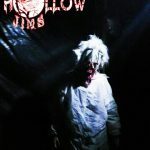 There are a lot of actor-driven sound effects at Booger Jims Hollow, from revving chainsaws to simply banging on nearby walls. This leads to a tiny bit of bleed from scene to scene that sometimes helps in building anticipation for what is might appear around the next corner. In the house, we encountered some things unlike what we’ve seen in any other haunts, from the clown room’s closet and barrel to the foam-dotted stairwell. There’s an unfinished appearance to the walls of the house – not that the haunt has not detailed them, but rather that they retain the appearance of the old mill house that the haunt is in. The mountainside hollow is dotted with the ramrod-straight bars of bamboo and the cast have managed to turn the layers and layers of plastic sheeting lining the trail into something that passes for what one would call a drop panel in a traditional haunt setting – openings where actors can suddenly appear and vanish with a scream. 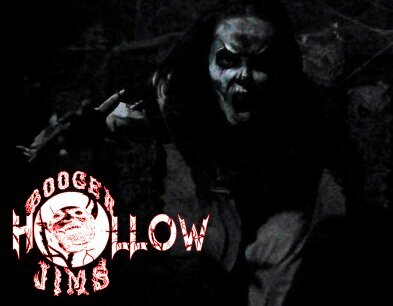 The overall theme of the haunt is the legend of Booger Jim – a local story of a rage-filled man. 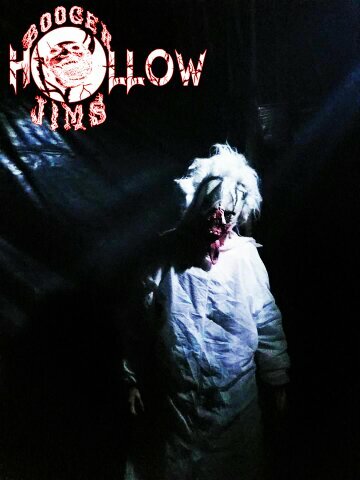 While you venture through the trail, you’ll most certainly hear about Booger Jim’s inevitable approach; however, after you leave the haunt, you may be wondering exactly which marauding monster was the infamous Booger Jim. So beset will you be on all sides by any number of clowns, doctors, monsters, and freaks that you’ll be tripping over your feet trying to escape the anticipation of what could possibly be coming next. While the house does, perhaps, a slightly better job of building this suspense, the trail is just as adept at amping up the tension of Booger Jim’s approach. Our group venturing the trail was about half the size of our group that went through the house; five in the former, ten for the latter. Despite this, both areas did a good job of spreading the scares throughout the entire group. While some scenes would hit the front, some of the same monsters would vanish only to startle the back of the group with another sudden appearance. The aforementioned peek holes/drop panels in the trail all leading up to the box of Booger Jim’s contained anger, or the chaos that was the clown room closet and barrel, followed by chainsaw-chasing creeps: all of these led to some great chances for scares. Don’t think you’re safe at Booger Jims Hollow until you reach the security of your car. Monsters and ghouls can appear anywhere around the house or leading up to the hollow. Both the house and the trail at Booger Jims Hollow are one combined price of $15. 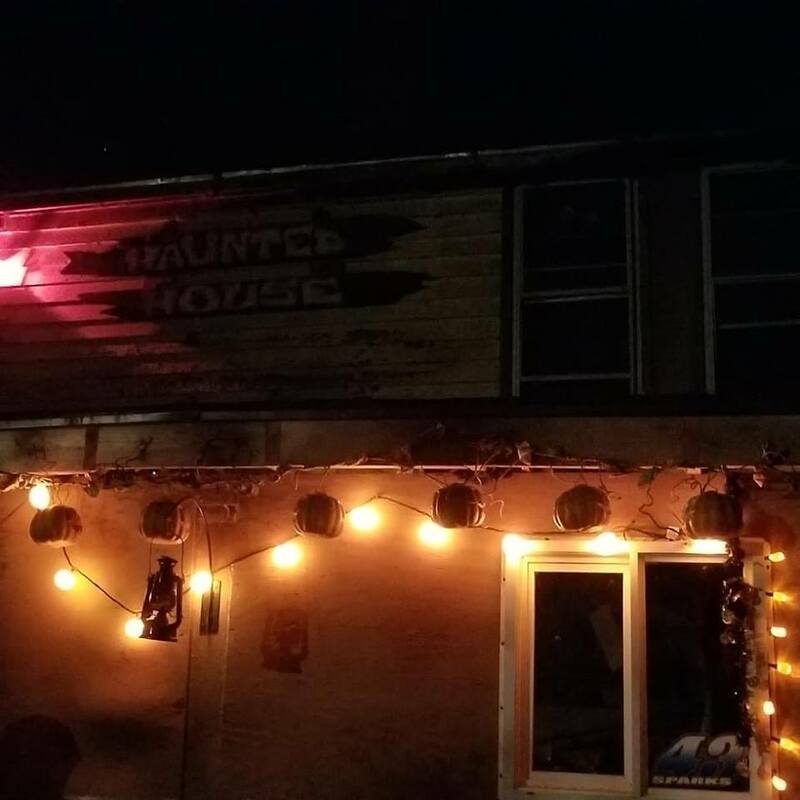 Though the haunt may not be the longest in the area at 16 minutes, for the price and the entertainment, it’s certainly carrying some bang for your buck with a 1.07 MPD (minutes of entertainment per dollar spent) rating. 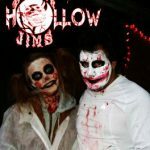 We can heartily recommend grabbing a bunch of your friends, listening to some creepy music on the winding roads, and taking a chance on hiking through Booger Jims Hollow any Halloween season. Super scary and so fun. The fact that they can touch you upped the scare factor so much. We loved it …show more and plan on going again this year!